I love when I see a thing that was originally a Kickstarter campaign not only fund and then deliver, but become available for general release. This is one such story. 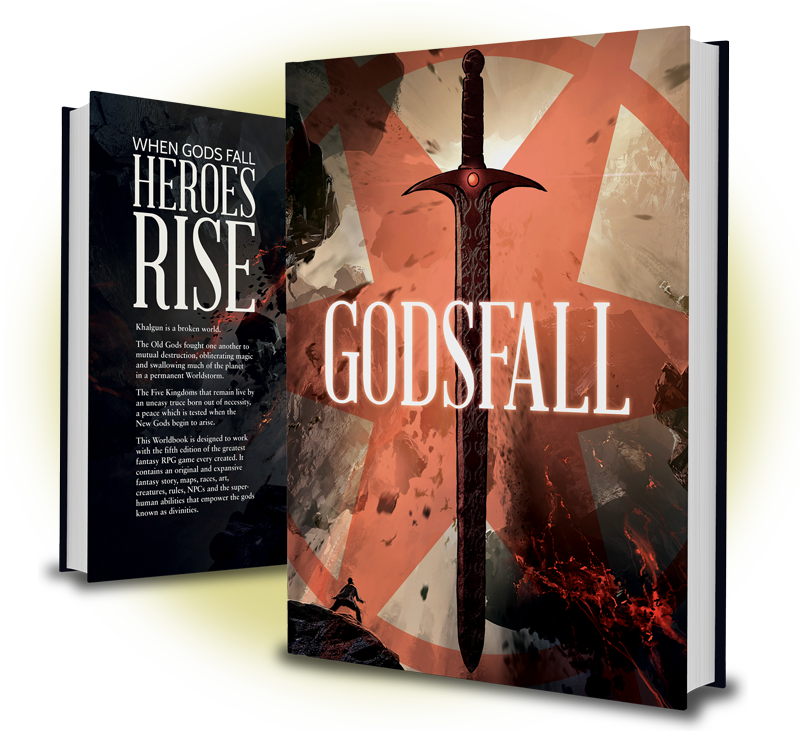 You can now order the Godsfall worldbook for your very own. Godsfall is a setting for 5th Edition based on the Godsfall podcast. There's all manner of information, from the different races, to the deities, to the history of the realm. Get your name on the list and get the book as soon as it's available. Khalgun is a broken world. The Old Gods fought one another to mutual destruction, obliterating magic and swallowing much of the planet in a permanent Worldstorm. The Five Kingdoms that remain live by an uneasy truce born out of necessity, a peace which is tested when the New Gods begin to arise. The Godsfall Worldbook was designed to work with the fifth edition of the greatest fantasy RPG game ever written. It contains an original and expansive fantasy story, maps, races, art, creatures, rules, NPCs and the super-human abilities that empower the gods known as divinities. After a Kickstarter campaign that raised more than twice the original goal set for production, the Godsfall Worldbook is ready for pre-order.